Depending on your reason for travel, the selection of where you will stay is a varied decision. Are you a business traveler who seeks a room close to Santa Cruz restaurants, yet still wants turn down service and an iPod dock? Is Wi-Fi a must, or do you prefer to leave technology at home? Are you looking for a romantic getaway or a long term rental? Whatever your reason for travel, the locations on this page represent the best of what Santa Cruz has to offer. Beach Bungalow Vacation Rentals offers multiple year- round rentals within two blocks of Monterey Bay. All of the beautiful properties are owned and managed by the same family, therefore they have a vested interest in making sure you are satisfied with your stay. Rates vary with the season; both short and long-term stays are welcome. Get closer to nature while continuing to spoil yourself! Located about a half hour north of Santa Cruz on Highway 1, Costanoa was created for people who prefer a gentler kind of camping. Offering furnished canvas cabins with heaters, down comforters, and tent service. Stay in the 40-room lodge or take a more private retreat in one of the Douglas Fir cabins. While you’re here, enjoy a spa treatment or take part in one of their weekend yoga retreats, or guided nature hikes. Other activities include mountain biking, horseback riding on private trails, and tide pooling. Do you seek an oceanfront rental? Are you bringing your pet? Look no further- A house in Santa Cruz offers multiple vacation rentals located oceanfront, ocean view, or in beach neighborhoods. All rentals are owner-managed,and some are dog- friendly. Their highly interactive website offers multiple search options and a map that allows you to select the area in which you prefer to stay. This charming 2 bedroom 1 bath cottage is available year round. It is 150 steps or four houses up from Twin Lakes State Beach. Close to the Santa Cruz Pier, Beach Boardwalk, and Harbor. Rates vary by season. Offering fully furnished vacation rental homes, condos, apartments, and cottages in Capitola, Santa Cruz, and Aptos areas. Long and short term vacation rentals available. Enjoy a home with a panoramic ocean view of the Monterey Bay or a cottage in beautiful Capitola Village just steps from boutiques, galleries, fine dining and casual restaurants, nightlife with live entertainment, and, of course, the beach! Kendall & Potter Property Management offers a variety of home services – including complete property management services, leases on unfurnished properties and rental homes in Santa Cruz, as well as Monterey Coast & Santa Cruz vacation rentals management and corporate housing. Beachnest Vacation Rentals range from beachfront studio cottages to luxury executive estates. Located in diverse and premiere beach neighborhoods – from small and quiet “away from it all” communities to dynamic and convenient locations in downtown Santa Cruz. Family- friendly and pet- friendly rentals available. 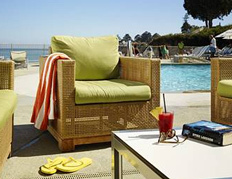 The Dream Inn is a beachfront hotel in Santa Cruz, offering upscale accommodations perfect for a weekend escape, corporate event, family vacation or a romantic getaway. Ideally located a few blocks from The Boardwalk and close to UC Santa Cruz, the Dream Inn is Santa Cruz’s upscale boutique hotel. This local standout is known for great service and spoiling its guests. Located just a short drive’s away from Santa Cruz, this is one of the area’s finest hotels, complete with top-notch service, generously sized guest rooms and many amenities. Ocean Echo’s quaint cottages are ideal for your next business trip or family vacation. Their accommodations are just right for large families or the lone traveler; many rooms can fit 4 or more people comfortably. Guests enjoy their own kitchen complete with a gas stove and full-sized refrigerator. Enjoy comfortable, modern accommodations at Hampton Inn Santa Cruz as well as complimentary hot breakfast and convenient access to many of the area’s best attractions. One mile from downtown and only two miles from Santa Cruz Beach Boardwalk. Chaminade Resort & Spa’s guest rooms and suites offer enticing luxuries. Decorated using hues of the California coast and Spanish furnishings which reflect the resort’s history; granite bathrooms, lather toiletries, and down duvets are standard. Whether you need to check email or simply want to curl up in your bathrobe, you’ll find Chaminade has anticipated all of your needs. Call 800.283.6569 for guest room reservations. Probably the most beautiful of all Santa Cruz hotels, the gorgeous spa there is just an added bonus! Located only a mile from the beach and two miles from The University of California, Santa Cruz, this newly renovated Comfort Inn® Santa Cruz hotel boasts a convenient location. Within walking distance guests can find basketball courts, baseball fields, a playground, and four 24-hour restaurants. On site, guests enjoy free Comfort Sunshine® Breakfast, free wireless high-speed Internet access in all rooms, an outdoor heated pool and hot tub, a sauna, and fax services. At Seascape, you can pretend you have your own beach home with all the perks of a four diamond resort. Seascape Beach Resort offers 285 spacious suites and beach villas with fully equipped kitchens or kitchenettes, fireplaces, and private balconies facing Monterey Bay. Resort Options include championship golf, in-suite spa treatments, a romantic option, the popular beach-fires-to-go, discounted tickets to Santa Cruz Beach Boardwalk, and much more. Feather beds, luxurious gardens with waterfalls, and a babbling brook welcome you at the Babbling Brook Inn. Decor in the 13 unique suites is reminiscent of world-renowned painters and poets such as Monet, Renoir, Cezanne, Degas, and Tennyson. Among the many unique amenities are daily breakfast and dinner services. All guest rooms offer luxurious feather beds, and most accommodations have fireplaces and spa tubs. Perfect for business and leisure travelers alike, the new Holiday Inn Express & Suites Santa Cruz offers well thought out amenities.The rooms feature HD Televisions, HBO, iPod docking stations, writing desks, and free Internet access. Complimentary buffet breakfasts, a full fitness center, a business center and a great location near downtown and the boardwalk make this affordable hotel a nice option for lodging in Santa Cruz. The Beach Street Inn was recently purchased by two local families and renovated into a premier beachfront boutique inn. Perched atop one of the most spectacular scenic vantage points on the Santa Cruz coastline, Beach Street Inn and Suites offers guests breathtaking views of the Monterey Bay. Special rates and amenities like a seasonal, heated outdoor pool, guest laundry facilities, and a picnic & BBQ area make The Beach Street Inn a great choice. Offering the warmth and coziness of a classic beach hotel with a full array of modern amenities. The Seaway Inn is a short stroll on the beach from the Santa Cruz Beach Boardwalk and the Santa Cruz Wharf, a perfect choice for family vacations and romantic beach getaways. Kitchen, ocean view, and two room suites available. This charming, boutique-style, pet-friendly Santa Cruz hotel is located three miles from the Beach Boardwalk and beaches of Monterey Bay. Check out their affordable vacation packages. Whether guests seek a romantic seaside getaway or a family weekend building sandcastles, Best Western Capitola By-the-Sea offers roomy guest quarters with perks. Treat yourself to homemade cookies, in-room fireplaces and whirlpools, free wi-fi, heated outdoor pool and spa, and a complimentary breakfast. Guests are within walking distance of historic Capitola Village restaurants and shops and enjoy easy access to Santa Cruz beaches. Check out more about Santa Cruz spas, health clubs and gyms. The Inn at Depot Hill has been the recipient of both the Mobil 4-Star award and AAA’s prestigious 4-Diamond rating with the finest of décor and amenities. The 12 spacious rooms feature fireplaces, feather beds, fine linens, bath robes, and bath salts. Jacuzzis and hot tubs are available, and all rooms and suites are smoke free. Enjoy a full breakfast in the dining room or delivered to your door. Pamper yourself with afternoon wine and hors d’oeuvres, evening desserts, turn down service, and off-street parking. Do you seek the feel of home, without the commercialism of a big business hotel chain? Hinds House has look and feel of a luxury Santa Cruz bed and breakfast, however they don’t serve breakfast. Reservations are accepted for one week or longer, and a fully equipped kitchen is available for guest use. The West Cliff Inn is the most recent addition to the Four Sisters Inn’s list of enchanting inns. This distinctive Santa Cruz, California bed and breakfast inn is situated on a bluff across from Cowell’s Beach and the famous Santa Cruz Beach and Boardwalk. Many guest rooms feature ocean views and jetted spa hot tubs. Rates include a breakfast buffet, afternoon wine and hors d’oeuvres, evening turn down service, morning newspaper delivery, and bicycles to borrow for exploring town. Do you seek a casual, farmhouse feel for your CA vacation? Apple Lane Inn is a Victorian farmhouse perched on two acres of sunny Aptos hillside property. Close to beaches, restaurants and all three Aptos, Soquel, and Capitola villages. Soak in the beautiful gardens, farm animals, barn, and orchards while relaxing in their serene outdoor sitting areas. Five guest rooms in the four-stories, with meadow and garden views are featured. Full breakfast is served. Historic charm and a stunningly beautiful facade make the Bayview Hotel a strong reminder of days gone by. The 11 guest rooms each have their own private bath and modern amenities, including TVs, phones and modem hook-ups, offset by Victorian antiques, fluffy beds, and fine linens. Extended continental breakfast is served on the veranda. Children welcome; $200 deposit for small pets. Cliff Crest is a 1887 Queen Anne Victorian estate overlooking the ocean and Loma Prieta Mountains. Full breakfast, including fresh fruit, homemade muffins, eggs to order, and mint tea from the garden is served in the sunny solarium. It’s a short walk to the Wharf, Boardwalk, beaches, and downtown. Each of the five rooms has its own bath, some with original claw foot tubs, and ocean views. Location, location, location. This 1910 cliff side beauty designed by William Weeks overlooks the surf break at Cowells Beach and the Santa Cruz Municipal Wharf. Enjoy breakfast, off street parking, wi-fi, available refrigerator, turn-down services, and ironing services. There are 5 private bathrooms and 2 shared bathroom options available. “European style with an artist’s eye and a grandmother’s heart,” is the way owner Sitah Cummings describes her inn. Pets and children are welcome in this cedar home with wrap-around veranda. Each of the three rooms is plush and clean, has a fireplace, antique furnishings, leather couches, and quality linens. Located two country blocks from miles of hiking trails. The owners prepare the daily breakfast from organic ingredients, most grown on the property. Redwood Reflections offers a country style retreat on 10 redwood-filled acres in the Santa Cruz Mountains. Its three country-style rooms (Bridal Suite, Bear’s Den, and Barn room) have decks and wood stove fireplaces. Enjoy the vintage recreation room with soda fountain, piano, merry-go-round, swimming pool, evening bonfire pit, and trail walks on the property. Strawberry waffles with whipped cream is a favorite choice at their full breakfast. Located in South Pacific, Vanuatu is a tropical islands paradise, perfect for a weekend getaway or an extended holiday. The islands are dotted with sandy beaches, lush vegetation, and incredible sea life, combined with friendly Melanesian culture.